Heat butter in a pan, add chopped onion,garlic, ginger saute few mins. 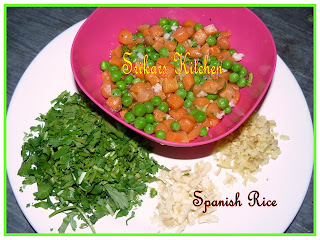 Add carrot,peas to saute 2-3 mins & Add all peppers, tomato puree,soya sauce & Seasoning. Add the Boiled rice & Mix well. First time I hear of the Spanish Rice but it sounds delicious. mmm. delicious colorful rice. My fav. one. That's a healthy colorful tasty platter of rice. 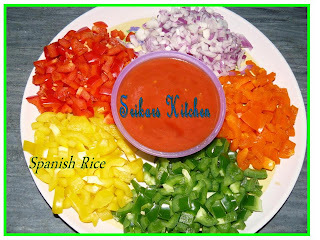 Spanish rice looks good & colorful.... i always like the plump-grained rice they use for this. 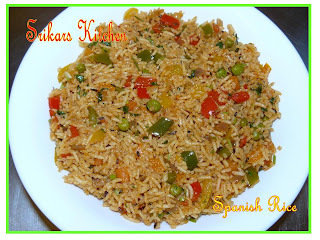 Spanish rice looks so colourful and delicious.....Will try this for sure . looks so delicious.. will have to try experimenting it..! !